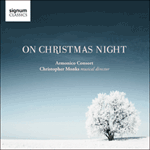 Hope finds a way by Jonathan Roberts (b1983) was first performed in one of the Consort’s Christmas concerts. Christopher Monks states that ‘Jonathan Roberts has been an assistant for our workshops for some time and we’ve been training him up for two or three years now. He thrust this piece in front of us and I think it’s very, very beautiful’. The text is by Vaughan Roberts, and the work is scored for harp and upper voices.